From personalized toothpicks to roaming trays, these mouthwatering catering ideas will help you plan the perfect cocktail hour. Display petit fours inside glass bell jars. Not only is it pretty, it’ll help ward off any bugs. Save your servers the trouble of having to explain dishes by utilizing a chalkboard tray. Royal Fig Catering created this cinnamon roll tree for a wedding brunch. Spice up dessert and get the party started with sparklers. This wooden table cocktail hour display was inspired by farmers’ markets. Inserted forks make it easier for guests to grab, eat and discard. Distressed furniture with shelves and cabinets are perfect for mini desserts. 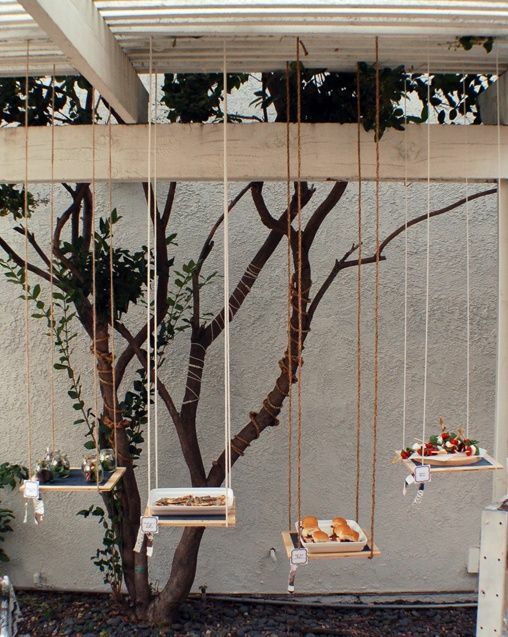 For a whimsical touch, display hors d’oeuvres on hanging platforms. Individual appetizer boxes are ideal for passing. Complement mini burgers and french fries with a lucite tower. Small baskets of fries are a fun nod to the frying basket. Food is art, so why not opt for a painting palette display? Personalize your appetizer toothpicks with flowers or flags. Roaming food stations such as this cheese cart are a crowd favorite. If carts aren’t your thing, roaming food trays are also a unique idea. 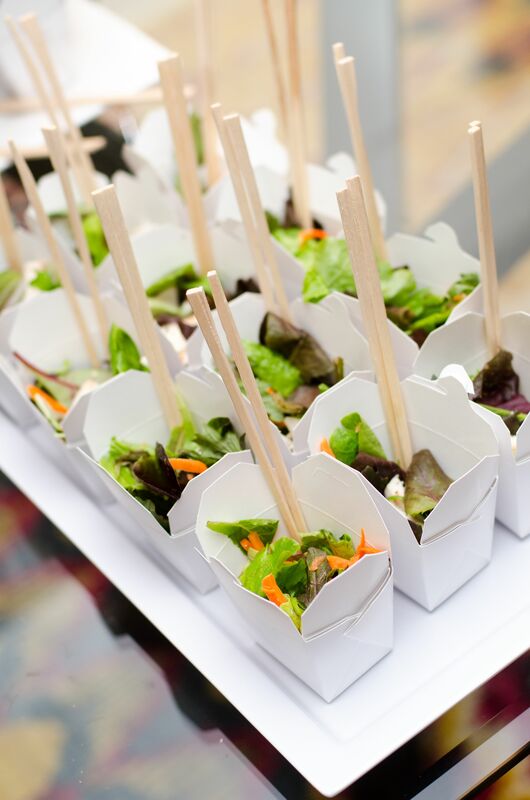 Serve salads or noodles in food cartons with chopsticks. A shadow box tray allows you to display flowers, photos or a special symbol or monogram. These vegetarian spring rolls were placed in zucchini boats atop a bed of moss and flowers.